Have you ever noticed how some coffee beans come packaged in a stand up pouch? It is this style of coffee bag that inspired our latest drawstring pouch. 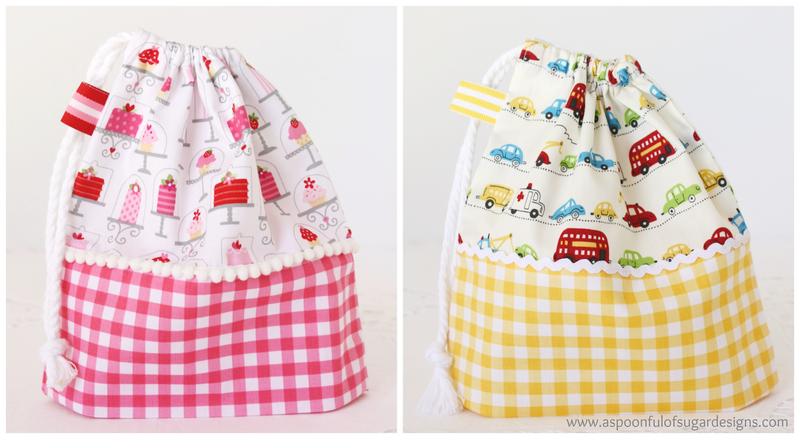 Made with a cheerful print and partnered with some gingham, it features a stand up design with a drawstring opening. Sized at 7 3/4 inches x 7 3/4 inches, the Mini Drawstring Pouch is perfect for storing all manner of things in a school bag or suitcase (e.g. tissues, toiletries, small toys, school supplies etc). 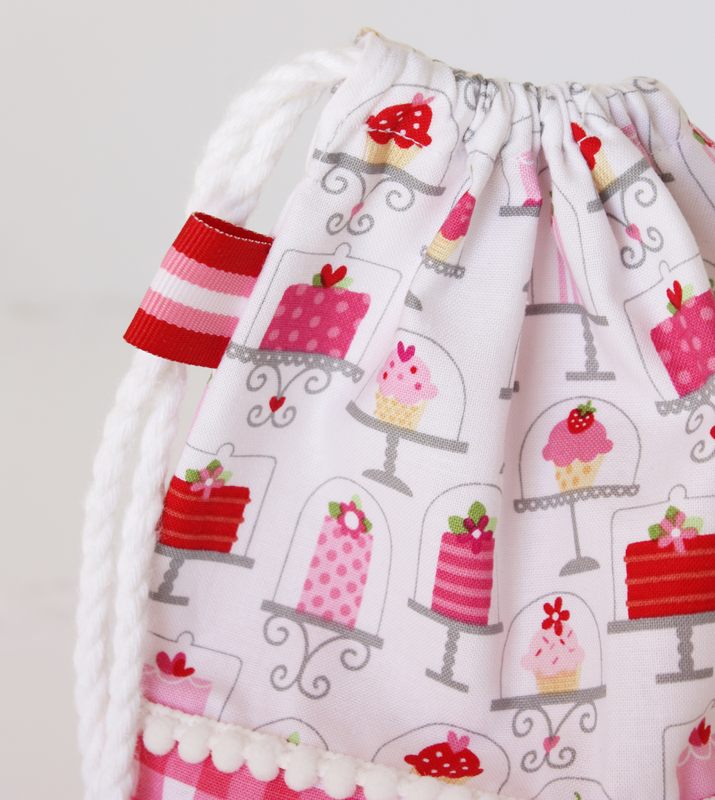 The Mini Drawstring Pouch is a handy size and would make a fun gift for someone starting school. 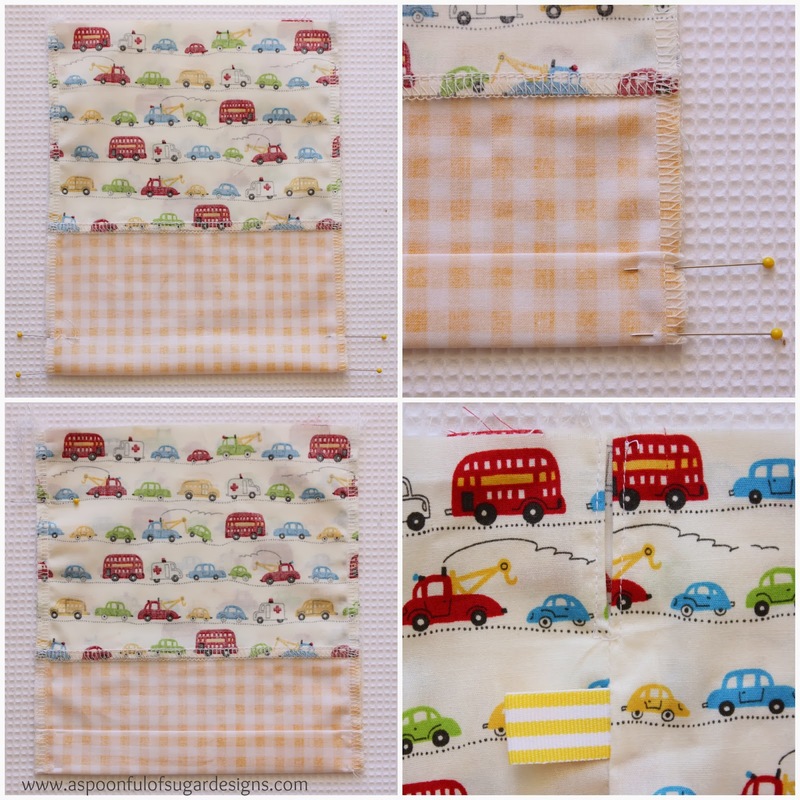 The fun part of this project is coordinating some small novelty prints with gingham/checks/dots, and adding coordinating trim and ribbon accents. 1. 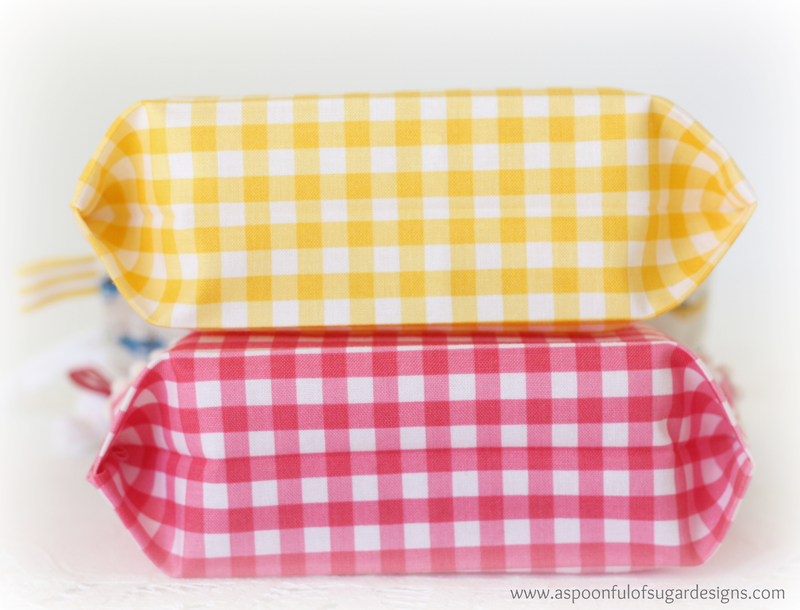 Using 1/4 inch seam, stitch the novelty print rectangles to each end of the gingham print, as shown below. Overlock/serge raw edges of seam allowance and press. 2. Stitch pompom trim or ricrac to each seam. 3. Fold the ribbon in half and baste in place 2 1/4 inches down from the top left hand side of the pouch. 4. Overlock the raw edges around the outside of the fabric. 5. Fold the pouch in half with the right sides together. 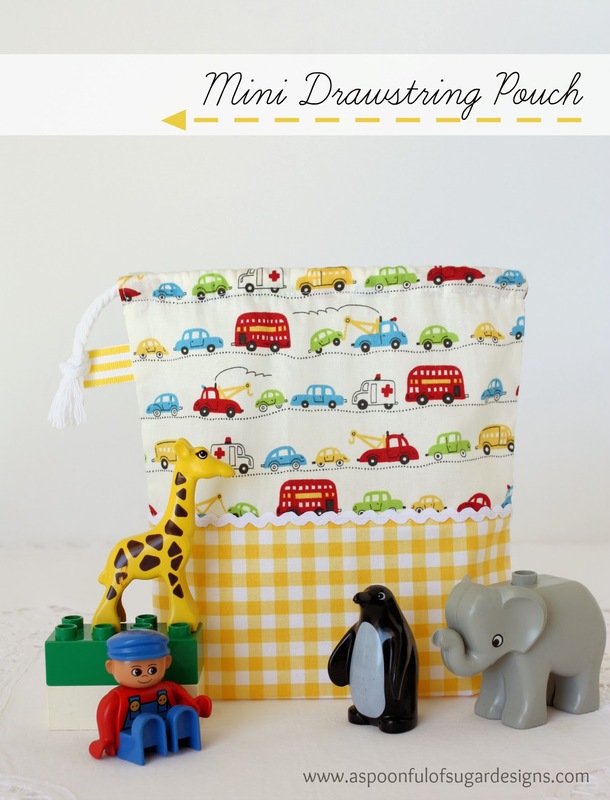 Use a pin to mark the bottom of the pouch and 1 inch above the fold line. Fold the bottom edge over by 1 inch and press (as shown in photo below). 6. Stitch the right hand side of the pouch from the top to the bottom, catching the fold in the bottom of the pouch. On the left hand side, stitch from 1/2 inch above the ribbon tag, to the bottom of the pouch (as marked with a pin in the photo below). 7. Stitch the seam allowance in place around the opening at the top of the left hand side of the pouch (refer to photo below). 8. Fold over 1/2 inch around the top opening of the pouch. Press. Fold over another 1/2 inch and press. Stitch in place. Thread the piping cord through the channel at the top of the pouch. Tie the ends of the cord in a knot. I LOVE these pouches and decided to make my granddaughter one. When I folded the top to the inside 1/2 inch and then folded again 1/2 inch, the opening for the cording was on the inside of the bag. Where did I go wrong? Hi Sandra – On the side of the pouch with the ribbon tag, don’t sew the top 1 3/4 inches. That way when you fold down 1/2 inch and then another 1/2 inch to make the casing, there will be the opening on the outside. Hope this is clear. Beautuful !!! Where are these fabrics from? 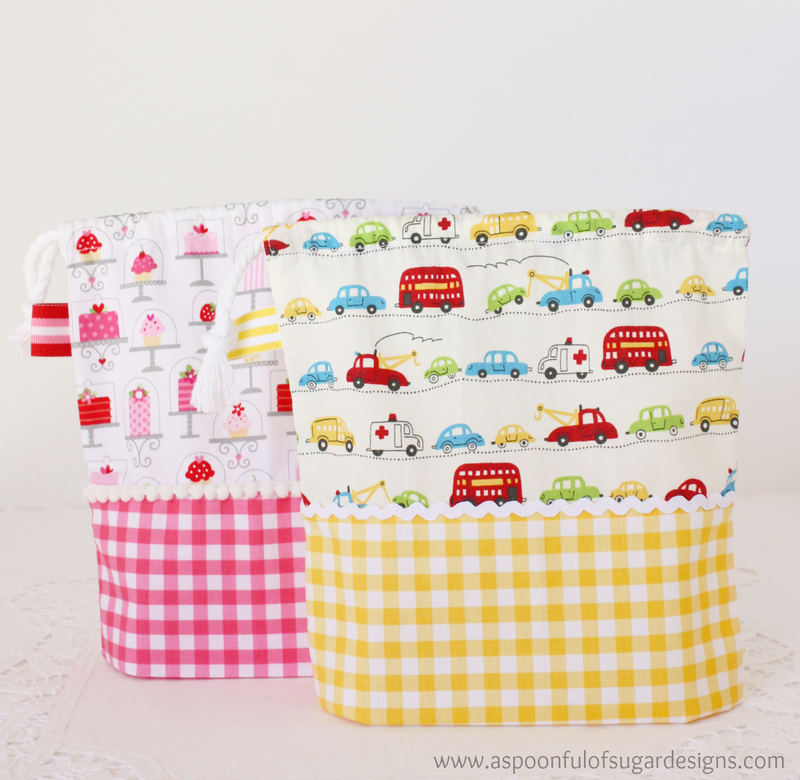 Thanks Serena – the gingham is a Riley Blake gingham and comes in a large range of colours. The other fabrics I have had in my stash for a while. The car fabric is a Japanese print from “D’s Selection” produced by Junko Maisuda (Japan}. So pretty and I love how you stitched the bottom! I don’t like squaring off the corners of bags. Just wondering, is there a way to make a lining and fold the top over rather than a drawstring? Hoping to make some bags as favors for my daughters baby shower. Thank you! Thanks Michele. If you made the lining about at least an inch longer, there should be enough fabric to fold over to make a channel for the drawstring. Enjoy planning for the baby shower! I want to tell you how much I love this site. I have used so many of your ideas. I love this project and made several for my grand daughter. 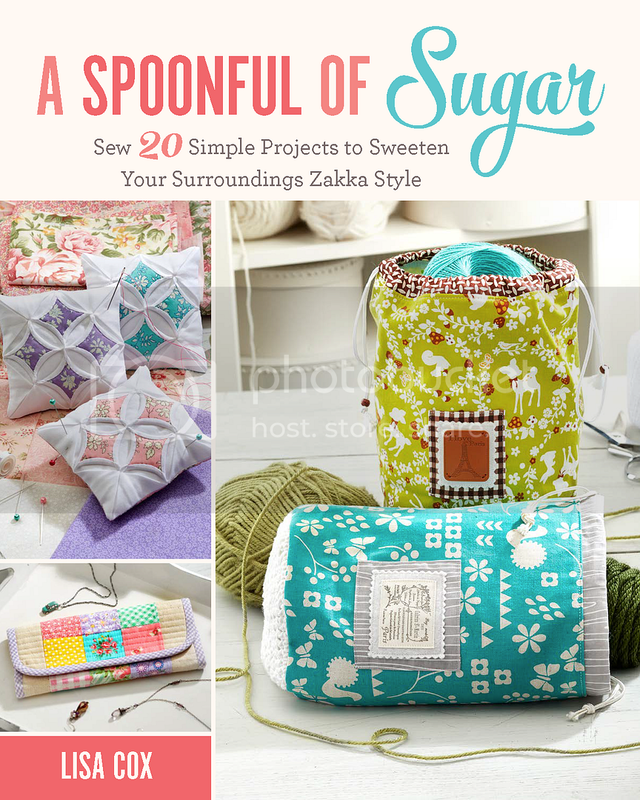 Each one has a themed fabric to match the contents. It helps her keep her toys organized. The unique pouch fold at the bottom is so much easier than traditional boxing. Thank you for sharing your great ideas. Love these! I made 2 today using a retro fruit print and a modern ticking fabric on bottom. They look adorable. Can’t wait to make a bunch more. Thanks Tania. Fruit and ticking stripe sound like the perfect match!